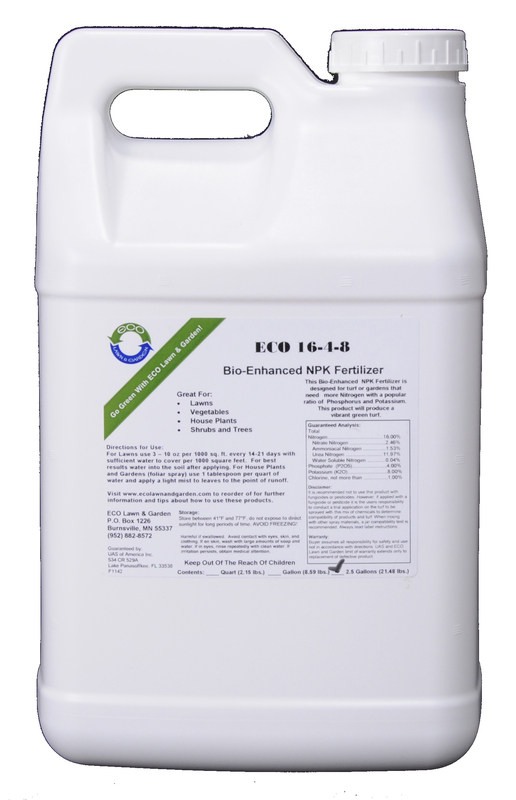 ECO 16-4-8 NPK Liquid: THE MOST POPULAR NPK AVAILABLE! 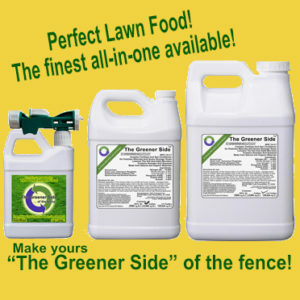 Great for trees and shrubs! Perfect for house plants too! 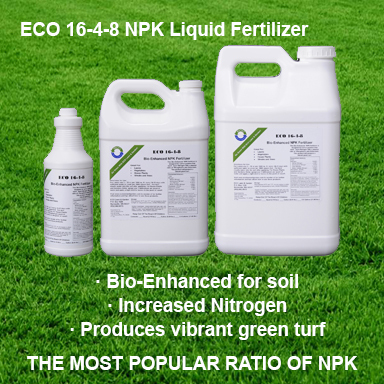 This is our most popular NPK fertilizer for turf. This Bio-Enhanced NPK Fertilizer is designed for turf that needs more Nitrogen and a popular ratio of Phosphorus and Potassium. 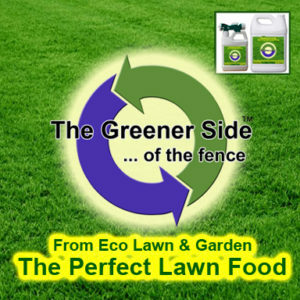 This product will produce a vibrant green turf. 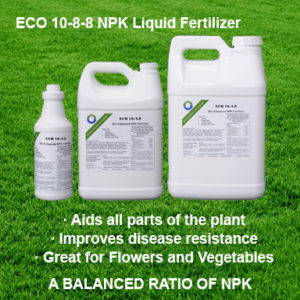 is a water soluble, bio-stimulated, hot mixed, homogenized NPK formulation. It’s specially developed for different stages in the plants life cycle. Each cycle in the plant life is different from growth to bloom to fruiting. Therefore it needs more or less different elements to complete its job at each cycle. Plant growth energies can be divided into two separate parts during its life cycle. ANIONIC- In this stage the plant is in the growth mode. It starts from the time the plant emerges from the seed to the point where the plant has matured or begins to flower. Higher NITROGEN is needed to aid the plant in this stage. CATIONIC- In this stage of the plant life from flowering to harvest, the plant is in the production mode and no longer actively growing. 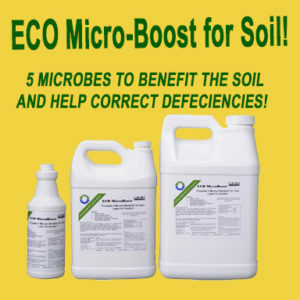 Higher PHOSPHORUS & POTASH is needed in this stage. 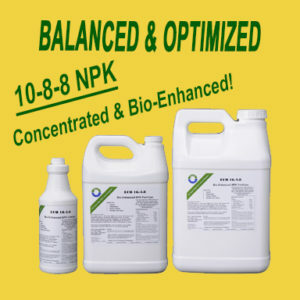 We have added bio-stimulants to each of our hot mix homogenized NPK formulations. 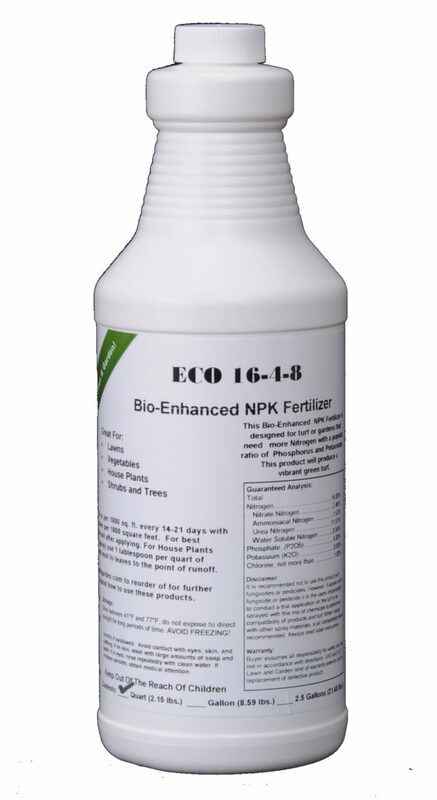 Our biological Npk’s includes a compliment of Fish, Seaweed, Humic Acids, Vitamins B-1, B-12, growth promoters, regulators, Molasses with trace elements such as Boron, Iron, Zinc, Cobalt, Copper, Manganese, Molybdenum, and Sulfur.We use only natural nontoxic food grade raw materials in our products. 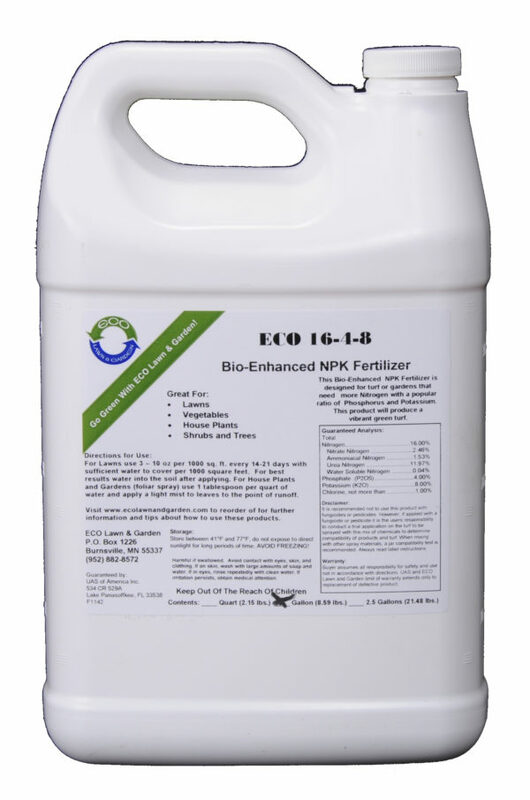 House Plants & Gardens: Foliar spray, 1 tablespoon per quart of water, mist leaves until run-off, apply as needed. Note: To ensure compatibility with foreign products, a jar compatibility test is recommended. Always fill tank with water first, then add product while tank is circulating. 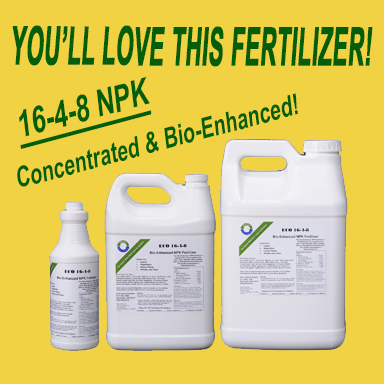 NEVER MIX CONCENTRATES DIRECTLY TOGETHER.Guaranteed Analysis:Total Nitrogen = 16.00% | Nitrate Nitrogen = 2.46% | Ammoniacal Nitrogen = 1.53% | Urea Nitrogen = 11.97% | Water Soluble Nitrogen = 0.04% | Phosphate (P2O5) = 4.00% | Potassium (K2O) = 8.00% | Chlorine = <1.00% Derived From: UREA, Potassium phosphate, ammonium phosphate, Ascophyllum Nodosum Seaweed and Menhyden fish. 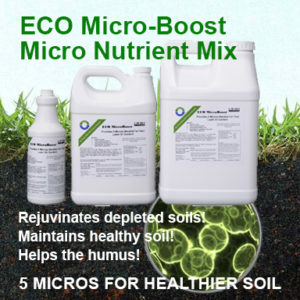 Contains Amino Acids and Humic Acid Benefits of Use: Increased turf vigor and is immediately available to the plant Problem Condition: Lack of growth and lack of color Disclaimer: It is not recommended to use this product with fungicides and pesticides, it’s the user’s responsibility to conduct all trial tests. 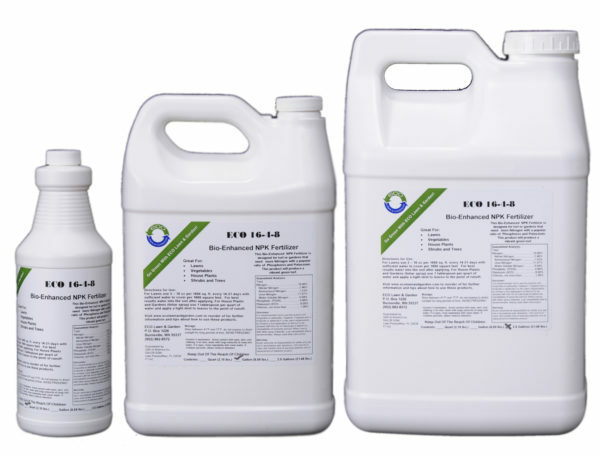 Physical Properties:Weight per gallon = 10.31 lbs | Ph = 7.5 – 8.0 | Each gallon contains: Nitrogen = 1.65 lbs | Phosphorus = 0.42 lbs | Potash = .82 lbs Appearance and Odor: Cocoa brown liquid, sweet seaweed / fish / earthy odor. Storage: Store between 41°F and 77°F, do not expose to direct sunlight for long periods. AVOID FREEZING! Container Size: 1 qt. ; 1 gal. ; 2.5 gal. Caution: Keep out of reach of children. Harmful if swallowed. Avoid contact with eyes, skin and clothing. If on skin wash with soap and water. If in eyes, rinse repeatedly with water.